I’m writing this post to share with you guys something very exciting that I have been working on. I would like to invite all of you that have been following this page to join the Food Allergy Mama Bear Recipe Support Group on Facebook. If you are interested in checking it out, you can find it here. I created this group in the hopes that it can act as an additional resource for those managing food allergies, and dietary restrictions. This is a place where members can share recipes (or baking/cooking tips) that pertain to baking without one or more common allergens (Wheat, Dairy, Egg, Peanuts, Tree Nuts, Shellfish, Fish, and Soy). Recipes that cater to other allergies are also more than welcome to be shared, such as rice, corn, or sesame free recipes, or gluten-free recipes. Vegan and vegetarian recipes are also welcome. Bloggers are encouraged to share their recipe posts here, as long as they are catering to one or more dietary restrictions. All posts must be relevant to allergy friendly baking and/or cooking, however. Be forewarned that spamming (posting content that is not relevant to this particular group) will not be tolerated, and offending posts may be deleted. 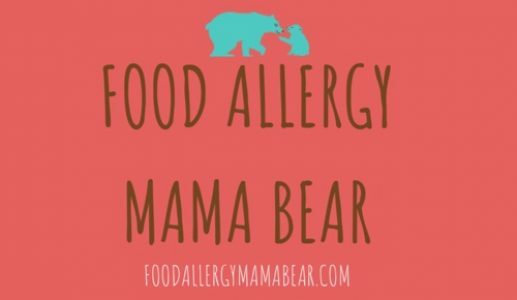 The Food Allergy Mama Bear Recipe Support Group is also a place where people can reach out to other individuals managing dietary restrictions with questions pertaining to ingredients, baking/cooking methods, or specific recipe requests. Our group is still fairly new, but it is getting off to a great start. We have a lot of wonderful individuals participating in the group, sharing recipes, and helping others. I have received a lot of positive feedback from people, expressing how helpful this group has been for them, especially those that are new to the food allergy life. I couldn’t be more excited about this group, and where it is headed.